When it comes to working with parapet beams and soffits, we can provide practical working solutions that will not only help your business to work more productively, but also ensure complete safety for all operatives. Our high pressure hydrodemolition equipment is perfect for under bridge cutting & removal. The Superior Hydrodemolition Technique – Aquajet Systems from Aquajet Systems on Vimeo. This articulated arm can be utilised with any kind of Aqua Cutter Robot. It can be easily and swiftly mounted onto the robot, cutting down on wasted time and allowing workers to carry out the work efficiently. It allows workers to perform hydrodemolition work outside the parapet beam. The parapet beam attachment is simple to set up because it fits neatly into the four receptacles found on the Aqua Cutter. There’s no need for special tools or equipment when setting up, and all the operations it performs can be controlled by the Aqua Cutter robot. Under bridges can be a challenging area for hydrodemolition, but with the innovative under bridge attachment the task becomes much simpler. The attachment can be easily attached to the Aqua Cutter. 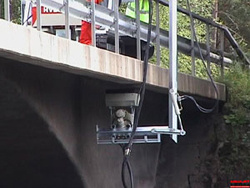 When utilising this attachment, the Aqua Cutter is capable of working from the deck to the underside of the bridge, with no dismounting of the parapet. As before, there is no need for any specific tools or any change in the set up when performing this work. 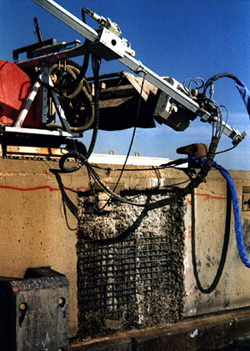 All of the under bridge functions are powered from functions which already exist, and are performed using the Aqua Cutter robot’s control panel. If you’re in search of a new and safer way to carry out under bridge concrete cutting and would like to enquire about our hydrodemolition techniques and equipment, don’t hesitate to get in touch with us for a water jet bridge cutting & removal solution.